A classic set of six colors in 38 ml. sticks to help you get started (Naples Yellow, Cadmium Green Pale, King’s Blue, Turkey Red, Turkey Umber Greenish, Neutral White). A collection of six 38 ml. sticks in colors that can be found in nature (Neutral White, unbleached Titanium, Brown Pink, Stil de Grain, Green Earth, and Blue Ochure). A soft palette of six 38 ml. pale colors (Brilliant Yellow Extra Pale, Green Gold Pale, Scarlet Extra Pale, Celadon Green, Ultramarine Blue Pale, Cerulean Grey). 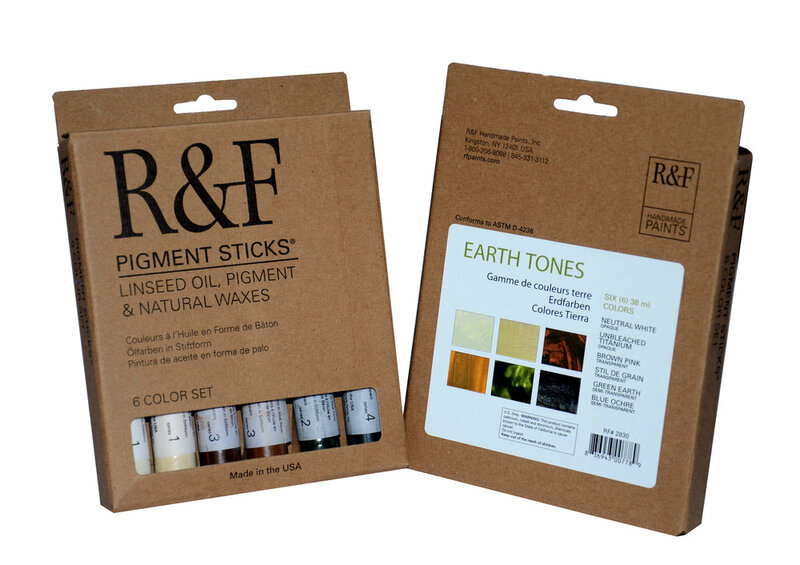 Great for layering and creating tinted washes of color, the Translucent Color Set offers a range of gem-like tones. It includes six 38 ml. pigment sticks (Indian Yellow, Alizarin Orange, Alizarin Crimson, Egyptian Violet, Ultramarine Blue, and Viridian) and a cradled 6½" × 7½" (16.5 cm × 19 cm) Ampersand Gessobord. A perfect introduction to the medium, this set includes six 38 ml. 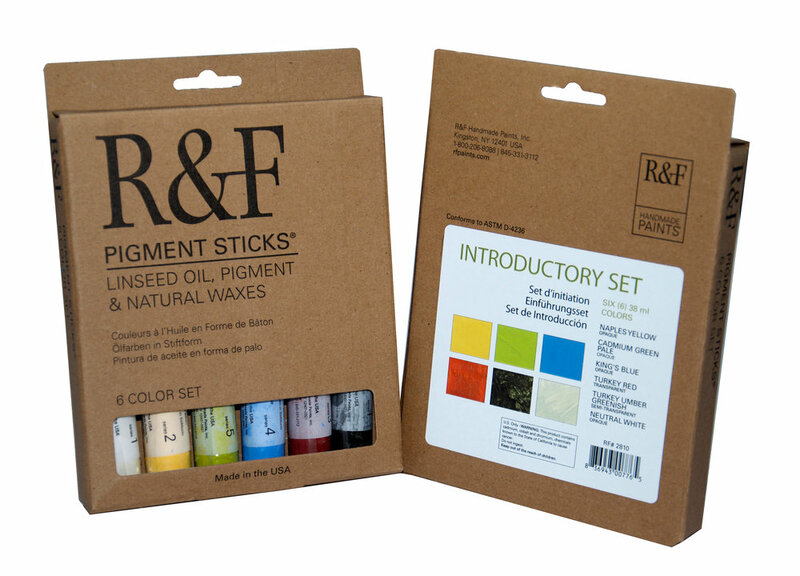 pigment sticks in opaque colors (Titanium Zinc White, Cadmium Yellow Medium, Cadmium Red Medium, Cobalt Blue, Chromium Green Oxide, and Ivory Black) and a cradled 6½" × 7½" (16.5 cm × 19 cm) Ampersand Gessobord. Reflecting a painterly palette, this set contains twelve 38 ml. pigment sticks (Brilliant Yellow Extra Pale, Cadmium Yellow Light, Indian Yellow, Dianthus Pink, Cadmium Red Medium, Quinacridone Magenta, Turquoise Blue, Cobalt Blue, Indigo, Veronese Green, Cadmium Green Pale, and Turkey Umber Greenish) and a cradled 6½" × 7½" (16.5 cm × 19 cm) Ampersand Gessobord. A collection of luscious colors to expand your palette, this set contains twelve 38 ml. pigment sticks (Blue Ochre, Turkey Red, Magenta Earth, Stil de Grain, Olive Yellow, Permanent Green, Cobalt Teal, Unbleached Titanium, Ultramarine Blue Pale, Phthalo Green Pale, Green Gold Pale, and Cerulean Grey) and a cradled 6½" × 7½" (16.5 cm × 19 cm) Ampersand Gessobord. Pigment Sticks without pigment. They are ideal for glazing colors, can be worked directly into a color to increase the color's transparency, or used to blend colors together on the surface. Available with drier and without. (Our sticks with drier contain a small amount of Cobalt Drier added to speed up the drying time. The use of a Cobalt Direr can affect color, so best use is to work colors on top of it after it has been laid down on the surface.) Available in 38 ml., 100 ml., or 188 ml. sticks or 8 oz., 16 oz., or 32 oz. jars.